This content is provided by Connally Plumbing, plumbing company serving New Braunfels, San Marcos and the surrounding areas and member of the New Braunfels Chamber since 2016. If you ask any small business owner what their number one source of new business is, they’ll most likely say referrals and word of mouth. These channels are essential, especially for well-established businesses who have built up good networks over time. That being said, how do you capture new clients who may not be in your network? Also, how can you as a business owner utilize your existing network to stand out? One of the easiest and often underutilized methods is to build your online reputation with reviews. 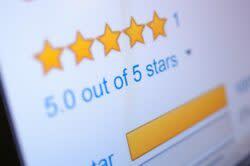 In a recent study by BrightLocal, they found that 92% of consumers read online reviews. Additionally, 68% said that positive reviews make businesses more trustworthy. This research is consistent with other studies that suggests consumers want to make educated decisions about a local company before they make a purchasing decision. So where should you get reviews? Not all reviews are equal, and you definitely need to think carefully about where to get reviews before you start asking for them. It is very important to make sure you have first claimed and optimized your Google business page. This will help increase your SEO, which we all want. Once you’ve claimed and verified the business listing, you should now start to ask satisfied clients for a review on Google. Here are some good instructions for how to ask for a review on Google. Another good option is to have a designer create cards with instructions for your clients. Once you’ve completed your service for them, simply give them the card and request the review if they’re happy with your work. Most likely, if they’ve had a positive experience, they’ll be happy to share a review. Yelp is much more than just a website for hipsters who like fancy coffee. It actually performs very well for search terms people are using when shopping for local services (i.e. roofing, photography, plumbing, etc.). If you can get a few good reviews for your Yelp business page (free), you’ll likely appear in the top 10 results for your services in your Yelp city page. This means more traffic and more qualified leads! Yelp is a bit more selective on how you get reviews on their website than Google, so be sure to check their review policy. That being said, here are some approved ways to build reviews on Yelp. The final major review source that I recommend to clients are prominent industry directories. Oftentimes these websites rank very well in search and get a lot of targeted traffic by industry. An example of this is TheKnot.com. If you are in the wedding industry, it is very important to have quality reviews on your business listing as a lot of brides will be on the site shopping for their wedding. By having great reviews from other brides on your profile, you will establish more credibility and stand out. As the business owner, you most likely already know what websites provide the best traffic for your business, so just make sure you have some quality reviews. There are many advantages of building positive reviews for getting new clients. That being said, positive reviews also help negate an occasional negative review. It’s not uncommon for unhappy people to leave an occasional one-star review. Hopefully, this is not an anomaly, and not indicative of normal customer experiences for your business. Regardless, if you’re proactively building positive reviews, you can help protect your business against an occasional negative review. Lastly, consumers are pretty good at smelling out fake reviews, so be sure to abide by best practices as outlined by each website. Have you established a review strategy for your business?